Gordon Moore. Flap. 2018. water based medium on photo-emulsion paper. 14" x 11"
Gordon Moore. Catawall. 2018. acrylic, latex and pumice on canvas. 30" x 20"
Gordon Moore. Untitled. 2018. acrylic, latex and pumice on canvas. 40" x 30"
Gordon Moore. Tip. 2018. acrylic, latex and pumice on canvas. 30" x 20"
Gordon Moore. Concurrent. 2018. acrylic, latex and pumice on canvas. 30" x 20"
Gordon Moore. Comma. 2018. acrylic, latex and pumice on canvas. 30" x 20"
Gordon Moore. Sliver. 2018. acrylic, latex and pumice on canvas. 30" x 20"
Anita Rogers Gallery presents Small Verticals, an exhibition of new work by American artist Gordon Moore. The exhibition will be on view February 6 through March 16 at 15 Greene Street, New York, New York. There will be an opening reception with the artist on Wednesday, February 6, 6 – 8pm. 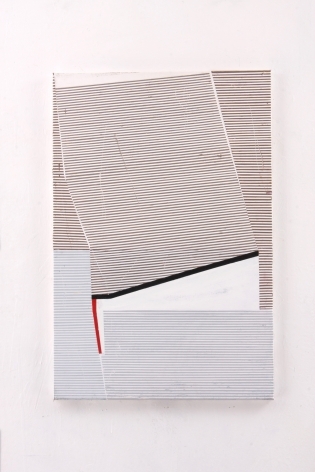 On view in this exhibition are a selection of Moore’s current interest in developing a series of small format works which investigate the dialogue between grounds of repetitive horizontal linear elements and specific “inlaid” configurations which interact with the shifting spatial fragments the grounds create. Obliquely referencing source material as diverse as venetian blinds, book pages or vent grills these works refer as much to the external world of quotidian life as they do the esoteric nature inherent in the world of pure abstraction which they exist in. These associations explore the interaction between repetition and “ordered randomness” which the artist has long mined as content prodigal with aesthetic potential. Devoid of social/political narrative, the works in this exhibition are an exercise in aesthetic refinement in communion with external visual associations which forms the genesis of the artist’s work. Concurrent with the above vertical paintings are a small selection of drawings which utilize photo-emulsion fragments of shadows cast from fire-escapes in tandem with the repetitive linear configurations referenced in the paintings. Gordon Moore's solo exhibition listed on the Galerie Editors' top picks this week.